When we are busy hustling for worth and belonging with others, we tend to build a wall around ourselves to protect from criticism and judgement. This wall also blocks feelings of inner love and acceptance. 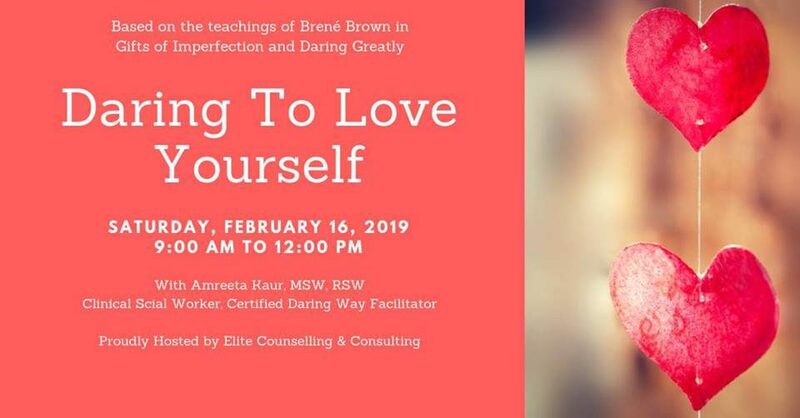 This Valentine’s Day workshop is geared for adults who are looking to break down this wall and create space to re-connect to themselves. Based on Brene Brown’s book, The Gifts of Imperfection, and her highly experiential workshop, Daring Greatly™, you will be invited to an interactive conversation about shame, vulnerability, and how to begin to live wholeheartedly. This workshop will offer you tools to build trust, empathy, and self-compassion. Please note that the building is not wheelchair accessible. We hope to see you there! Select link to register.